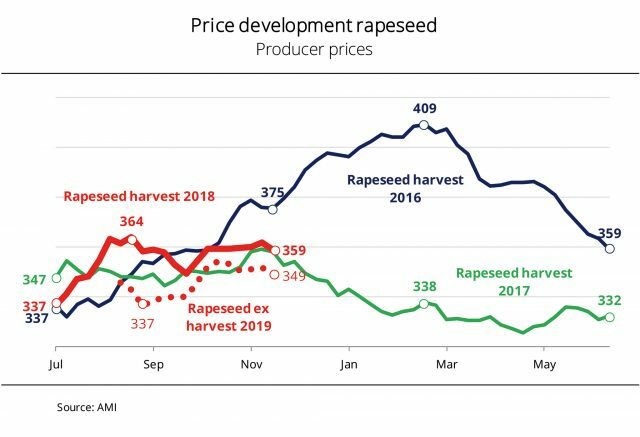 In Germany, UFOP reports that rapeseed prices have moved up slightly in very small steps since rising sharply in the summer due to the smaller rapeseed harvest. Consequently, the gap over soybean prices, which were in decline, widened, although rapeseed failed to reach previous years’ levels. The recently reported price of EUR 359 per tonne matched the year-ago level. Consequently, rapeseed was down EUR 26 per tonne from two years ago, when the German rapeseed harvest was considerably larger. The current changes in prices and comparatively low stocks motivate farmers not to sell their rapeseed for the time being. According to information published by Agrarmarkt Informations-Gesellschaft (AMI), sales opportunities are expected to improve for the second quarter of 2019 when supply of oil mills will still be very patchy. Nevertheless, rapeseed producers and agricultural traders will not be in a rush to sell the commodity during that marketing period, because even now there are many speculations on price increases in the transition to the 2019 crop. The small EU rapeseed crop in 2018, the foreseeable low export potential of Australia – traditionally the EU’s most important supplier –, and not least the difficult winter rapeseed sowings in Germany and France all fuel hopes that rapeseed supply will be scarce and prices will rise as a result. The rapeseed market is therefore not expected to pick up at the beginning of the new year, because price expectations of oil millers and farmers are likely to be still too disparate then.